#LetPompeyBreathe had another successful action day on the 4th April with a gathering in Guildhall Square, and a public meeting at the Southsea Village Pub later in same the day. 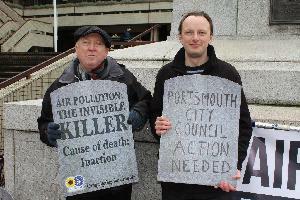 Portsmouth Green Party joined with Portsmouth Friends of the Earth and Keith Taylor MEP to call for Portsmouth City Council to tackle the illegal pollution levels in the city. The heath burden was symbolised by a cluster of head stones pointing out the approximately 100 early deaths linked to air pollution per year in the city, and the cause of death: "inaction". Leaflets were distributed by volenteers to the public, who in many cases were completely unaware of the danger they routinely exposed to by NO2 and particulate pollution. A letter was delivered by Tim Sheerman-Chase, a local air quality campaigner, addressed to the head of Portsmouth City Council, the Council CEO, the Regulatory Services Manager and the head of Portsmouth public health, calling for strong action to tackle the problem. The evening meeting was well attended with a panel comprising: Rachel Hudson, Portsmouth Friends of the Earth, Rob Bailey, Milton Neighbourhood Forum, and Keith Taylor MEP. Several people spoke out about their local concerns, including schools being next to busy polluted roads. Measures to tackle pollution were discussed, including improving bus services, a Healthy Streets policy for urban planning, improved monitoring around the city, ensuring new developments are sustainable including in terms of traffic pollution, and pushing for a car free day in the city centre. Keith launched his Polluted Cities Hampshire report, which outlines the situation in Portsmouth, Reading and Winchester. #LetPompeyBreathe is also launching a petition to call for action by Portsmouth City Council to address pollution. 1000 signatures will have the petition debated by the full council. (Watch this space for when it is ready and live!) This campaign forms part of the Green Party's national Breathing Cities campaign.